Cruise ships dock in the center of town. The town is lively but certainly not tacky touristy. It surely invites you for a pleasant stroll or shopping the specialty stores. Aghios Nikolaos is a small port of 25,000 residents on Mirambelou Bay in the prefecture of Lassithi. Larger ships anchor and will use their tenders to get the passengers ashore. 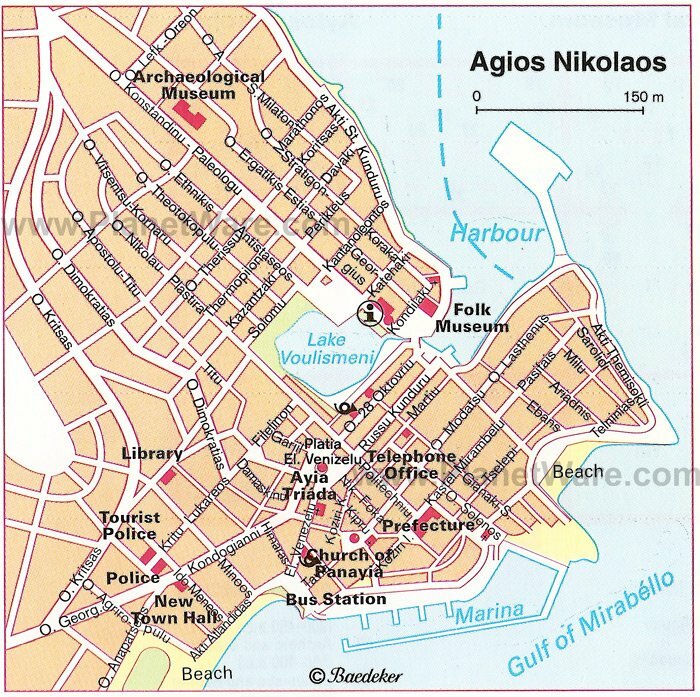 The name Agios Nikolaos means Saint Nicholas. The sea in Agios Nikolaos is superb and the surrounding area of the city is noted for its sandy beaches and beautiful bays. The landmark of the city is a small lake, known as "Voulismeni" that is located in the center of the city, at the foot of the cliffs. Its shape is circular with a diameter of 137m. Agios Nikolaos also possesses the second finest Archaeological Museum in Crete, where splendid archeological findings from throughout the Prefecture of Lasithi are exhibited. Taxis are an excellent value. Invariably will be a large, clean and air-conditioned Mercedes. Most drivers speak basic English and have none of the bad habits of many Med taxi drivers (loud local music, smoking en route etc). There are boat trips up the coast to see Barbarossa's cave and the old leper colony (formerly a Venetian fortress) of Spinalonga, which are fascinating and amazing value (do not spend more than 10 euros, there is no need) and usually include an ocean swim. Several operators offer boot trips including semi-submarine tours. Plenty of reasonable priced car rentals can be found in town, starting at 40 Euro all in per day, if you have full day in port. Knossos, a cruise ship organized tour is recommended, due to time restraints. Over 60 km away. Go to Almyros beach, a long sandy beach with a cold water stream entering the sea at the southern end. Perfect for a cooling paddle if the heat gets too much. About a 20-minute walk from the town center but worth every step! Alternatively, a taxi from the town center will only cost you about €8. A few kilometers north of the city is the jet set resort area of Elounda and the adjacent island of Spinalonga. Plenty of clean and attractive stores line the 2 main streets, mixed with nice and trendy cafes and restaurants. Thyme honey is a real local product. The bees here take the pollen from thyme and the subtle flavor is transferred to the honey.